We all know training is important (especially here at Aged Care Training)! The great news is the Victorian government agrees. Victoria has undergone a vocational education revolution and now guarantees a subsidised training place for EVERY VICTORIAN who does not have a post school qualification, or who wants to gain a higher level qualification than they already hold. This is called Skills First. There has never been a better time for individuals wanting to skill up regardless of the reason. To get a job, to be better at their existing job, upgrade their skills to help get a promotion! As long as the eligibility criteria are met the government is committed to helping Victorian’s up skill. It really is a major commitment to lift the skills base of Victoria. What makes the program so ground breaking is that is provides educational opportunities across the entire community. The opportunities that fall under Skills First are a big win for Victorian businesses and employers as well. Under the same program employers can help their people up skill and receive brilliant training. It is all about up-skilling and encouraging Victorian’s to get a higher level of qualification than they already hold and be the best you can be. Over 20 years of age (as at 1 January in the year of commencement of training) and seeking to enrol in nationally recognised training in a course that is at a higher level qualification than the one the individual holds. 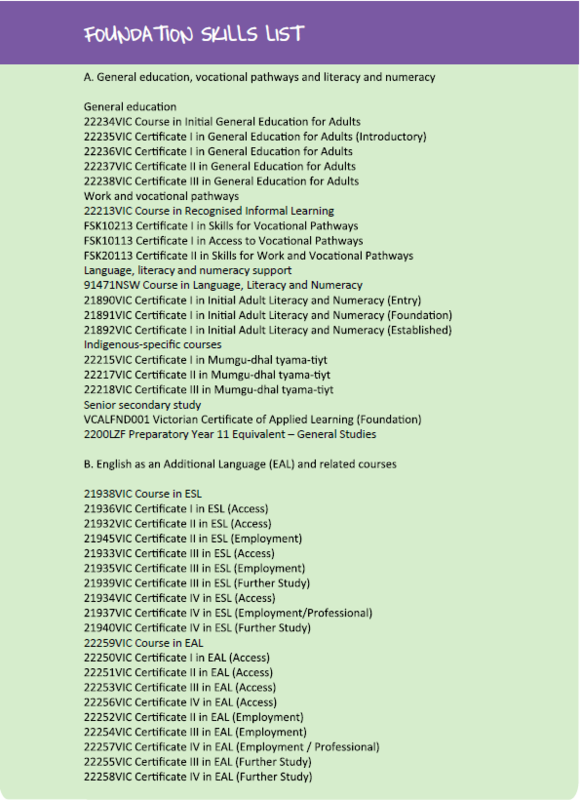 Effective 16 June 2014, the Department of Education and early Childhood Development adjusted the eligibility criteria for the Victorian Training Guarantee (VTG) program, such that students are allowed a maximum to two (2) government subsidised commencements at the same qualification level across their lifetime. This is known as the ‘2 at level’ limit. The limit applies in addition to existing criteria and requirements. An eligible individual must be aware that accessing a place in our VTG course will impact access to further government subsidised training. 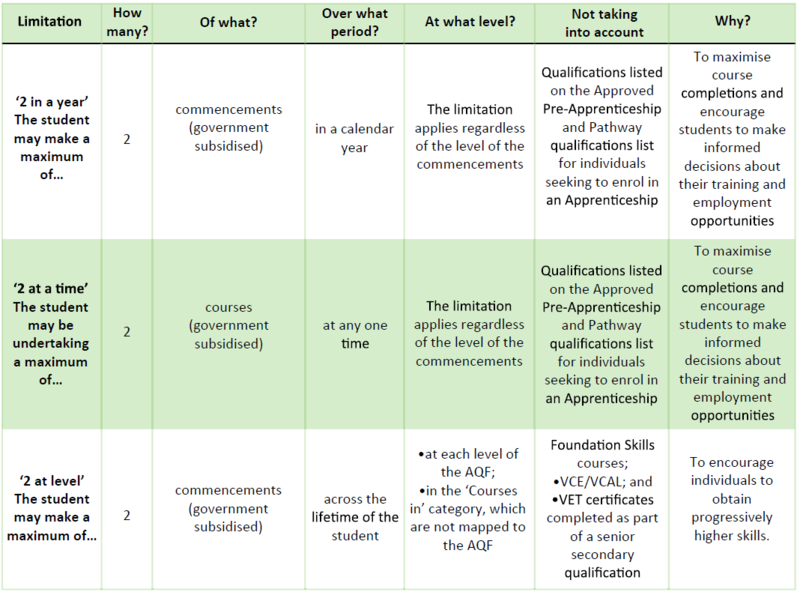 How many courses can an eligible individual do? They are enrolled at a school (excluding School Based Apprentive/Trainee) or registered for home schooling in Victoria you will not be able to receive a government-subsidised training place for a course through Skills First. The government supports schools in other ways to offer vocational training to their students, for further details discuss options with your school. e. Non-Australian qualifications, except where equivalency has been formally established with a qualification within the AQF. In accordance with the AQF and for the avoidance of doubt, Vocational Graduate Certificate and Vocational Graduate Diploma level qualifications are higher than qualifications at the Bachelor Degree level. A number of courses with the title ‘course in…’ are accredited. These are nationally recognized training products providing skills recognition leading to a Statement of Attainment, rather than the aware of a qualifiction recognized within the Australian Qualifications Framework (AQF). They are not aligned with the AQF. Enrolment in a ‘Course in ….’ Is subject to the same Skills First eligibility requirements as other enrolments. To address ‘up skilling’ requirements, an individual who holds a qualification no higher than Certificate IV is to be considered eligible to enrol in a ‘Course in…’ (Subject to meeting other eligibility criteria). 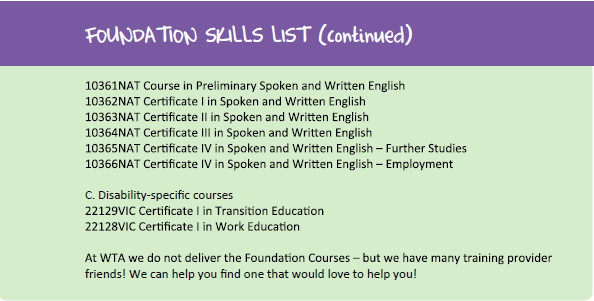 An Individual in not eligible for government subsidised training under Skills First in courses and qualifications on the Foundation Skills List if you hold a qualification issued by an Australian higher education provider that is at a Diploma or higher and or enrolled in the Commonwealth Government’s ‘Skills for Education and Employment’ program. Prior to the commencement of training, for each individual eligible for Skills First, we must complete Evidence of Eligibility and Student Declaration form and sight in hard copy original or certified photocopies of the original evidence of eligibility. A certified photocopy is a photocopy of an original document which has been certified as being a true copy of an authorised person. Please Note– Certified photocopies that are scanned or faxed are not acceptable forms of evidence. The authorised person must write on every page of the copy document “I have sighted the original document and certify this to be a true copy of the original” sign each statement and provide their designation for example “Pharmacist”. This training is delivered with Victorian and Commonwealth Government funding. Students with disabilities are encouraged to apply. Eligibility criteria apply. **The student tuition fees as published are subject to change given individual circumstances at enrolment. The $250.00 application fee covers initial assessment of RPL requirements. Further assessment (if applicable) will be charged at $60.00 per hour. Please note that approval from the individual will be sought prior to commencing any further RPL assessment. To secure a place in an upcoming course, a small deposit is required and the deposit is non-refundable once training has commenced. Payment plans are available and this enables individuals to pay their fees whilst completing the course. Dates of payment are negotiated with each individual. Where our RTO ceases operation, a full refund will apply (including deposit). If you withdraw prior to week 2 of your course, a full refund will be issued. If you intend to withdraw from your course, you must submit this in writing to info@agedcaretrainingservices.com.au. You must include your details along with the reason for withdrawal. Special consideration may be given on a case by case basis at the discretion of ACTS.